Going through the Motions or Living the Life God intended us to have???? Every morning we all wake up and pretty much have our routine and day all planned out. For me on most days my alarm goes off at 4:45am, I hit snooze 2x’s and get out of bed at 5am. I go to the gym, hope that I’m motivated to actually work out, come home, shower and get ready for work. My 2 girls wake up, I get them ready and make my “On the Go Breakfast”, (my favorite is pictured below, tons of protein, great antioxidants & of course a little bit of carbs since I grew up eating bagels), & the day goes on. Well the past 2 days between working 13 hour days and still making time for the gym, I realized I missed the most important thing that I was supposed to be doing, spending time with God! By the time I got through my routine I sat on the couch and fell asleep at 9:15pm. I was just going through the motions. Again, I woke up to my routine this morning thinking there has to be a better way to slow down and on my way home it hit me. I’ve recently read the book of Ecclesiastes and was trying to figure out what it all meant and after several days and weeks of just going through the motions it clicked. 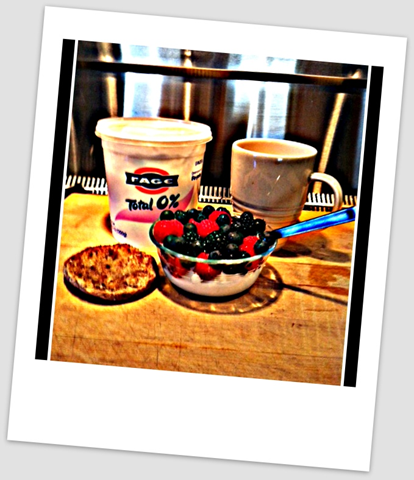 Fage Plain Greek Yogurt topped with your favorite berries. Who’s Ready for an Amazing Week?